The Vertex42® Yearly Budget Calculator is a powerful new combination of our Family Budget Planner and Monthly Budget spreadsheets. This budget calculator is designed to help you create and manage your budget on a monthly basis, all within a single worksheet. It allows you to (1) easily add or remove budget categories, (2) plan for irregular expenses, (3) plan based on a variable income, and (4) make future predictions to aid in decision making. 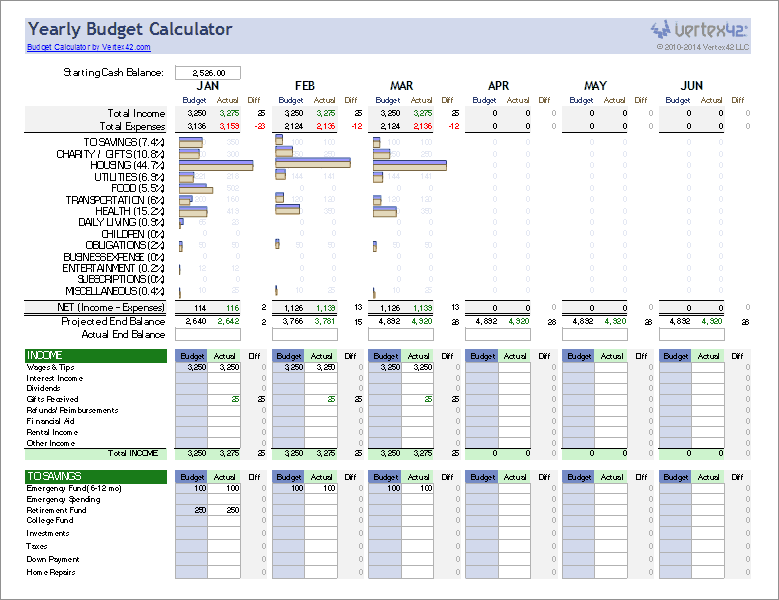 The Yearly Budget Calculator is a simple Excel spreadsheet that requires very little knowledge of Excel. If you want to edit or add categories, just make sure to use row operations (copying/cutting/inserting/deleting entire rows). Double-check formulas if you make any major changes or if you change the order of the categories. Creates a budget for an entire year. Graphs Budget vs. Actual spending for each month and each major budget category. Instructions: I've included a fairly extensive set of instructions and tips in the Instructions worksheet. Please read through the instructions before asking me questions about how to use the budget calculator. Step 1: Enter your Current Balance as of Month 1. This will usually be the sum of the balances in your spending account(s). Step 2: Edit, Add, or Delete sub-categories as needed. Remember the note about copying/inserting entire rows. Step 3: Modify the Month labels as needed, depending on when you are starting your budget. Budget Guideline #1 - Total Allocation or "It All Goes Somewhere"
- When creating your budget, you would generally want to make the NET (Income-Expenses) equal to zero. If you have extra (a Positive NET value), then you could allocate that to savings or paying off debt for example. If you have a negative NET, then you'll need to cut back somewhere or earn more money. - If you have multiple savings goals, add a sub-category for each one. Breaking out your expenses into specific categories will help give you a better idea of where you are spending and therefore where you may be able to cut back. So yes, you could probably get away with a single category for all "Entertainment", but I certainly wouldn't lump regular expenses in with variable expenses. - Add cell comments as needed to help explain costs. Cell comments show up as little red triangles, like the one to the left. This is one of the benefits of using a spreadsheet. For example, enter the names of Birthdays in comments for the Gifts Given category. - Include Irregular Expenses (non-monthly large lump payments) in the months in which they will likely occur, or use the approach of averaging the cost across each month. If you are using the averaging approach, I strongly recommend that you use a special savings account as a holding place for these larger expenses. That way, the balances in your spending accounts will more closely match the balance shown in the ACTUAL column each month. For example, if you are planning to spend $600 for Christmas, then put away $50 each month into a special savings account, and budget $50 each month in the Christmas category. - Enter an average monthly value for Variable Expenses (monthly expenses that change from month to month, like groceries). To calculate an average, you can find the total for the past 3 months and divide the value by 3. For groceries, especially, it's good to use the past 3-6 months. Make sure to maintain a good cushion in your spending account to handle these variable expenses. Step 5: Enter Actual Income and Expenses. Add cell comments as needed to explain the purchases. Use formulas like "=23+12+43" to add amounts from your various receipts. Generally, people use Quicken or other software to keep a record of transactions. If you set up your budget categories the same in the spreadsheet and whatever budget software you are using, you can use the software to generate reports and then enter the amounts into your budget calculator spreadsheet. Step 6: Each month, enter the actual ending balance like you did in Step 1. Resolve any differences between the actual ending balance and the Projected End Balance, by looking for mistakes, expenses you may have left out, etc.